I got some good feedback on the last script I posted- not a lot of feedback, but the comments I did get were good. So I am posting this draft of my script on Socially Necessary Labor Time (SNLT) before launching into the production of the video. Please, if you have any comments, criticisms, or suggestions that might make it a better script feel free to leave a comment. Because SNLT is a relatively simple concept at one level I tried to take this script in a more interesting direction- talking about the relation of SNLT to capital and to Marx’s critique of value and capital. SNLT is a great example of the practical, real-world nature of Marx’s value theory. SNLT is something very real that we can observe at work everyday. The private labor that goes on behind factory doors will not know for sure what its social value is until the products of that labor enter the market to be compared to the products of other workers. In the market these private labors become social. Socially necessary labor time is asserted. This SNLT then acts back upon production. It disciplines what goes on in the factory. Factories that were spending more labor than was socially necessary are considered inefficient. They must change their production methods or else go out of business. Factories that were producing under the socially necessary time, that were more efficient than average, are rewarded. Competition drives producers to constantly try to produce under the socially necessary labor time. If the SNLT for bread is 10 minutes a loaf and I make a new machine that allows my workers to produce bread for 5 minutes a loaf then I am producing at half the SNLT. But I still sell my product at the SNLT. This means that there is a difference between the amount of value I create and the amount of value I sell the product for. I appropriate extra profit in exchange. This is a super-profit. Why a super-profit? Well I already make a profit by exploiting my workers (I discuss this concept in another video). This is an addition to that profit. I am stealing profit away from my competitors in exchange when I produce under the SNLT. I can produce more products than my competitors in the same amount of time. I can out-sell them in the market, appropriating value in exchange. This race for super-profits is one of the main incentives behind all technological change in a capitalist society. This super-profit will attract competitors to increase the efficiency of their production. Soon everybody will be producing at 5 minutes a loaf. A new SNLT is established and my super-profit disappears. The race begins again to try to be the one who produces more efficiently than this. Thus SNLT is a constantly changing thing as capitalists compete to produce more efficiently than their rivals. Super-profit gives the illusion that value is being created in exchange. But it isn’t. It means that I am filching value away from my competitors who produce at the SNLT. The value is created in production, but transfered in exchange. (1) Any time a commodity is sold for more than its individual value, it is appropriating value in exchange. The money that buys the commodity represents more labor time than went into producing the commodity. But there is a finite amount of value in the economy because a finite amount of labor has been performed. When one person appropriates value in exchange it means that someone else looses value. Thus the competition around SNLT always has as many losers as it does winners. This production of value merely for the sake of producing value becomes capital. Capital is a process of value expansion in which money is invested in production not with the aim of producing any particularly useful things but in order to make more money. It is a never-ending cycle of money turning itself into more money. Constantly growing, constantly expanding. This capital doesn’t just take the form of money. It also becomes machines, raw materials, wages paid to workers… and a person: the capitalist. 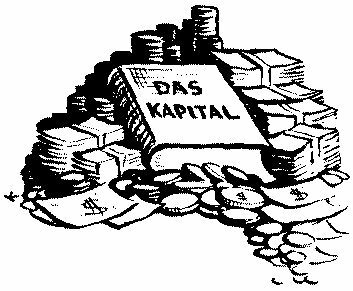 The capitalist is a personification of capital, a person who owns this process of value expansion. This means that we can see the social relation of capital in two ways. In one sense capital is an antagonism between our own creative powers and ourselves. Our own labor produces this surplus value that becomes an external force acting back upon society, shaping production to its own needs. In another sense this antagonism between society and itself becomes personified in an antagonism between workers and capitalists. The minority of people who own capital embody the interests and perspective of capital. By acting in their own interests capitalists also act in the interest of this impersonal force that is capital. As the amount of technology needed to produce at the SNLT increases this mass of machinery acts as a barrier to competition. A huge investment of capital is needed to start a business and enter an industry. As competitors who fail to keep up with the SNLT go out of business, industries centralize, gobbling up competitors. Capital becomes larger and larger, dominating more physical and economic space. Now imagine a socialist society of people operating the means of production in cooperation. Cooperation means no competition between producers to lower the SNLT which means no markets and no capital. Imagine a factory in this society in which the people who work the machines are the same people that design the machines. The workers don’t produce under the compulsion of competition because their pay is not a result of their output but a result of their needs. (Remember Marx’s famous description of communism: “From each according to his ability, to each according to his need”). This means that these workers have radically different incentives in the way they design and carry out their work. Rather than using technology to increase their output and pace of work in order to make a super-profit they would most likely use technology to make work more fulfilling, and reduce working hours. It is a sad commentary on the unfulfilled promises of capitalism that with all of the dazzling technological progress of our society we still have masses of impoverished unemployed and masses of people working 60 hour weeks, two-jobs, and foregoing retirement who still must rely on mortgages and credit to make ends meet. It’s sad that despite all the labor-saving technology in the world people still hate their work. In a capitalist society our own creative control over the labor process is taken away from us to become a tool for our own exploitation and over-work. Bourgeois theories of subjective value like to project the current subjectivities of modern society backwards and forwards in time as if humans have always been and will always be rational, utility-maximizing individuals operating with the same cold, calculating logic of the CEO. But economic choices for maximizing self gain only occur in a society in which we produce not for our own needs but for exchange. It is production for exchange which creates an autonomous force of profit and capital which drives society to follow its bidding. Our private labor doesn’t immediately become social. It must become value in order to be social. But in becoming value it is disciplined by socially necessary labor time. SNLT acts as an external force which disciplines our private labor, constantly compelling us to work more efficiently, yet never actually making our work easier or more fulfilling. SNLT creates the possibility for super-profits when one produces under the SNLT. These profits which stand above society, compelling the motions of workers, become capital. It is the expansion of capital that drives our work, not production for our own needs. In a society not producing for competition or capital, but for communal ownership there would not be a SNLT. The engineer-worker would be free to design their labor time anyway they wanted, without the external compulsion to maximize output per labor time. There would still be an incentive to increase efficiency, but it would not be an external compulsion to increase efficiency at the expense of the worker. A job would cease to be a job- that is, a passionless series of motions we are compelled to carry out in order to eek out a living in the market. Work could become something much more deep and fulfilling, a means of self-discovery and expression, and a means of establishing social bonds. A radically different notion of work would mean a radically different world. This entry was posted in The Law of Value. Bookmark the permalink. Quite clear. It is nice for you to include some mention of communism as opposed to have pure analysis – but including it within the analysis of SNLT in the context of SNLT and the subsidiary implications is a good idea. I have no questions or complaints, you did well. First of all I would like to thank you for your great work, which I am following now for quite a long time. I also tried to promote your weblog here in germany, hope it worked at least a bit. Keep up making these excellent videos! Concerning your current script: Just had the idea that the concept of super-profit, but also SNLT in general, could be useful in the analysis of economic relations between different national economies and why there are countries, for example like germany, which have a huge trade surplus compared to their number of employed workers. Of course there are also other important parameters: The real wages stagnated the last years in germany. Furthermore, from the perspective of SNLT one can address the question, why it is so difficult for third world countries to penetrate the world market — beside tolls imposed by the developed countries. Since it is necessary to advance an huge amount of money capital in order to be competitive, the third world countries are not able to overcome the gap between their economies and those of the industrialized countries. In that context we also would have to ask the question why china made its way to be competitive in the world market. Mr. Bungle. Thanks for the work promoting the site in Germany. If you ever feel moved to create some German subtitles for any videos (it is a bit time consuming but can be done online at a website called overstream.net) let me know. Regarding trade surpluses, I can’t say I am an expert on this but I would recommend reading the wikipedia entry on “super-profit” which delves into how this idea relates to international trade, monopoly, etc. I think the article gives a good summary of the way the term super-profit has been used by some different marxist thinkers. Creating subtitles for one of your videos is a great idea! I will let you know when I am ready to do that. My initial thought is that you are stressing the superprofits theme too much possibly to the extent of obscuring the fact that normal profits are derived from surplus value. You do refer to another video explaining SV but the understanding of surplus value is not integrated into this script. One thing that Marx does is establish concepts, such as absolute and relative surplus value with some rigour and then build on them in subsequent chapters. I suppose this is one reason why many find Capital difficult to read, the early difficult chapters have to be mastered in order to understand what follows. Marx’s purpose was to explain the riddle of why capitalists strive to make commodities cheaper when their overall goal was to maximise profits. I read the wikipedia entry on superprofits. There is probably more to this than I am aware of post Marx but my comments are based on my reading of Marx. I think this needs to be put in the context of absolute and relative surplus value. Machines to enable capitalists to extract surplus value at a greater rate whilst also potentially reducing the cost of commodities. Chapter 12, Capital. This does give capitalists some wriggle room, working hours can be reduced from a 10 year day to an 8 hour day and profits maintained or increased. Although it benefits the capitalist in one way to maximise working hours it is strategic for them to compromise sometimes to avoid open revolt. You are saying that machines have never made work easier in capitalist society. This lacks dialectical nuance. It would be easier to build the Egyptian Pyramids or the Great Wall of China in capitalist society. Exaggeration tends to obscure the valid point that capitalists will always strive to increase surplus value. You use the word socialism in this first sentence but some of the principles then described in this paragraph are communist not socialist. In socialist society there would still be division of labour and payment according to work. Bill, thanks for the detailed notes. Your comment about surplus value gets to an important, and perhaps not unproblematic, dimension about this Law of Value series. This series is quite consciously meant to be a modern-day version of Isaac Rubin’s “Essays in Marx’s Theory of Value” (available on Marxists.org) a book of separate but well-ordered essays on different topics in Marx’s theory of value: fetishism, social labor, abstract labor, etc. It is an interesting book in many regards, one being the level of abstraction with which much of it exists at: this is the level of abstraction of the first three chapters of Capital Vol 1, value as the social form of labor in a market society, prior to the introduction of capital as a category. There is actually no chapter in this book on exploitation, relative and absolute surplus value, etc. This in itself is interesting. For one it draws heavily on the interpretation of value theory as pertaining to a society of “simple commodity production” and capital as pertaining to a society of “capitalist commodity production.” I actually don’t think that this is the best way of interpreting the value-capital relation. Yet I think there is much power in understanding the abstraction of value before we proceed to the abstraction of capital. Marx must have thought so as well since this is the order of concepts he chooses in Capital. Ideally this video series would be proceeded with a sequel series called “the law of Capital”. But for now I am focusing on the current task at hand. One way in which I hope to modify Rubin’s strict levels of abstraction is to always keep the context of capital in the background when discussing value- because we can’t really have value production without wage labor and the private ownership of production (well… that could be a simplification…) So I am trying to bring out other aspects of capitalism when I can in this series. I hope this will make the series more relevant, more clear in how it relates to a critique of capitalism. But I disagree with the idea that we must understand surplus value prior to super profit. Marx introduces SNLT prior to his discussion of capital. It is only once we understand SNLT that we can understand relative surplus value. And super-profits are a result of the basic idea of competing to lower the SNLT. 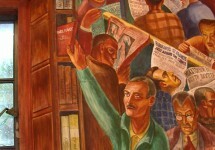 In a market society of socialist cooperatives competing in the market there would still be SNLT and super-profits without exploitation of wage labor. What do you think? In terms of the socialist/communist distinction, I think these two terms are defined so many different ways by so many different people that it doesn’t matter which I use. I usually prefer the word communism. But I think socialism provokes less antagonistic responses from the average joe and so I chose this word instead. I think you are right about “owning”. I haven’t read Rubin but it is on my list. I agree with you that Marx did really well in his sequence of explanation, that value must come before Capital. It’s also true that Marx delayed his explanation of competition and profits to volume 3 for good reasons. Surplus value is explained before profits. I bought Rosdolsky a while back but haven’t read it in full yet. Just read a section then. He does devote some space to analysis of Marx’s sequence and the reasons why Marx altered an earlier proposed sequence. Capital in general (vol 1) had to be made clear before the complexities of capitalist competition could be explained (vol 3), otherwise the whole thing would become too messy. Might be worth a look. Part one of “The Making of Marx’s Capital”. I suppose you do have this covered with the “imagine” word in your introductory sentence, “Now imagine a socialist society …” in the same way that John Lennon did in his “Imagine” song. I feel like the leave-competition-to-volume-3 idea is accurate only for a certain aspect of competition: competition to redistribute surplus value specifically through equalization of the profit rate, monopoly, rent, financial capital, etc. But we know that competition isn’t wholly left out of volume 1 because we can’t understand relative surplus value or SNLT without reference to competition. I agree though with much of what you are saying: that the source of SV in exploitation is prior logically to the redistribution of this surplus and that my order of presentation might be problematic here as it assumes that the viewer already understands surplus value. I suppose this might be solved by switching the order of the this video with the following one: “Law of Value 6: contradictions” which discusses the contradiction between the use-value and exchange-value of labor, exploitation and class antagonism. I am going to seriously consider this now based on your comment. There is also a video, “Law of Value 7: Production and Exchange” which discusses how value and surplus value can only be created in production while it can be transferred in exchange. I started to translate your transcript of ‘Capitalist Equilibrium?’ in order to create the subtitles in the next step. I chose this video, because you explain a lot of important concepts in one place. Perhaps you could contact me by email and we can discuss the details. I am also open to create subtitles of another video you might perhaps find more important. My attempt to email you at lavabit failed. I guess that’s not your real email? If you want to send me a personal message over youtube with your email address that might work. I don’t want to post my address here on the blog. Thanks for your work. I´m learning a lot with you. Thanks a million for the fantastic work you’re doing. I have shown your vids to tons of people who are interested in Marxism but are too busy to do the legwork in reading about it. My question is this (and I apologize if you answer it elsewhere, or if this is an inappropriate place to ask it): you describe human labour power as variable capital and the only commodity that can create value, but what about animals? Even before capitalism, weren’t animals similarly exploited for surplus value? And now, with the advent of factory farming etc, aren’t we witnessing the ‘refined’ exploitation of this variable capital? Thanks again for the vids. No, animals or machines for that matter do not create surplus value. ‘Value’ is the form that social relations take under the capitalist mode of production. It is incorrect to speak of feudal or future communist societies as producing value. You have to appreciate the difference between ‘labour’ and ‘labour power’ The worker does not sell her ‘labour’ per se. but her ‘labour power’, her capacity to work and reproduce herself for the next day. Good question Damien, here is how I see it. The ability of a chicken to lay an egg is a use value. In an egg laying factory farm human labour utilises and organises this natural ability of chickens so as to produce commodities (eggs) for market exchange. The humans do the labour which makes the production of eggs as commodities possible. Chickens are not capable of doing that sort of labour. Egg laying by chickens for private use in capitalism or in feudalism or primitive or future communist society is not commodity production. Commodity production is production of useful things for sale in a capitalist market place (and lots of things flow from that). I agree with Brendan that value, as a category from Marx, would not exist in these other societies. In the same way air is a natural value indispensable for commodity production. But we don’t count air as a value added part of the commodities that are being produced whilst the workers breathe. Because chickens lay eggs which is the commodity exchanged in the market place it looks different but I think in Marx’s analysis it is not. Egg laying for commodity exchange is a product of human labour utilising a natural ability of chickens, it is not a product of chicken labour. Marx’s argument is that only human labour adds value to commodities. His argument for machines is that the value of machines (created from human labour) is passed on or transferred to the commodities the machine helps to make. I agree with Brendan that the social form of value is the more important (and difficult to grasp) aspect but I don’t think he answered the quantitative aspect of the value produced by factory farms that does exist under capitalist commodity production. Thanks Bill, I think you’re right in your last paragraph above! Thanks for the answers fellas! What you’re saying about value makes complete sense. I suppose that I am still reluctant to see animals and machines equally as ‘fixed capital’ because the capacity for productive output of an animal’s labour (even if this output does not create value) is so much more elastic than that of machines/equipment. The capitalist’s outlook on animals seems more akin to his outlook on workers than his outlook on machines. Perhaps it is merely the vocabulary ‘fixed’ and ‘variable’ I find misleading.